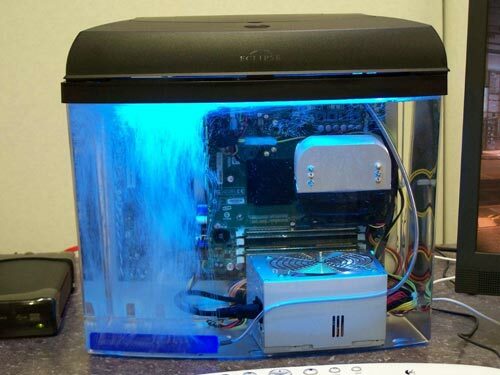 Check out this amazing PC, built inside an aquarium. It is cooled by mineral oil, and the oil is great for absorbing heat. After about 2 hours, the temperature settled at a new maximum of 84C on the CPU under load. So, the bubbles did have an effect, but not as much as we were hoping for. Interestingly, the bubbles also hurt the video card temperature, causing it to rise by a few degrees! It seems the bubbles also served to agitate all the contents of the aquarium, bringing everything to a more consistent temperature throughout. 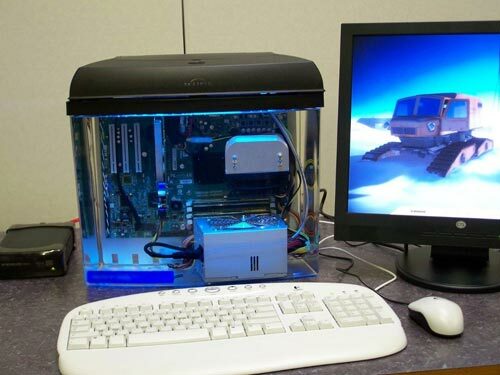 Check out this video of it in being built and working.